Threading in the inserts for 15mm Thru-Axle fork inserts is a mild pain with a regular pin spanner. The tool holes on the outside face are larger diameter than most spanners and since the dropouts are hooded it is necessary to lean the tool to clear the fork leg on each rotation as the insert threads in. It just feels sloppy and it is easy for the tool to slip and mar the insert face. Granted this is one of those small annoyances, but having a snug and convenient tool for tightening down fork inserts is inversely satisfying. 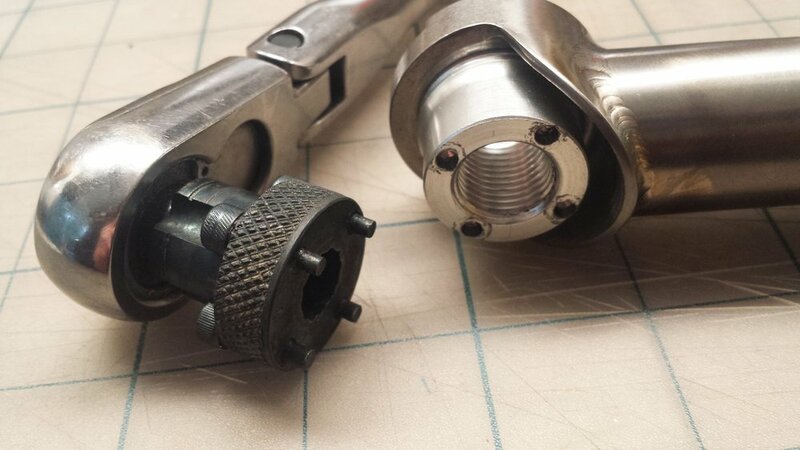 Dave came up with a quick fix using an old socket with a knurled holder and a quartet of M5 bolts turned down to pins of the appropriate diameter.